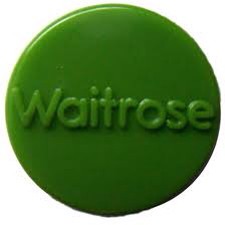 For those of you who (like me) are not regular shoppers in Waitrose, then you may not know that they have a great charity scheme. Every month each store is given £1,000 to give to local charity. Every shopper in the store is then given a green token, which you can use to vote for one of three local charities, the £1,000 then being distributed according to the number of votes for each of the charities. Our Bracknell Foodbank is one of the three charities for April in our shiny new Bracknell Waitrose. If you're a regular there, or just feel like popping in to see what it's like, then please be sure to vote for the Foodbank. Not only the Foodbank team, but also the thousands of residents who have benefitted from the Foodbank, will be very grateful.